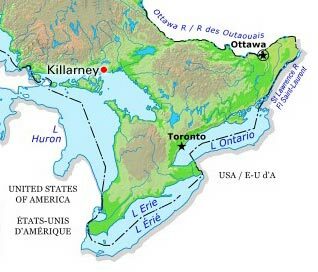 The oldest provincial park in Ontario and the first provincial park in Canada, Algonquin Provincial Park (established 27 May 1893, 7723 km2) is located 250 km north of Toronto. One of the largest of 48 parks in Newfoundland and Labrador, Barachois Pond Provincial Park (established 1962, 35 km2), is located at the head of St George's Bay, 70 km south of Corner Brook along the Trans-Canada Highway. Located on the Avalon Peninsula, Butter Pot Provincial Park (established 1958, 2833 ha) is 36 km southwest of St John's, Newfoundland, along the Trans-Canada Highway. Cape Scott Provincial Park (established 1973, 50 km2), on the northwest tip of VANCOUVER I, BC, includes 64 km of coast with 23 km of sandy beaches interspersed by rocky headlands. The land rises inland to Mount St Patrick (415 m), and in it lies a 44 ha body of freshwater, Eric Lake. Tucked into the westernmost corner of Prince Edward Island, Cedar Dunes Provincial Park (established 1962, 37 ha) has been developed around an historic lighthouse. Known as West Point, the site is the result of centuries of accretion of sand from a north to south coastal current. 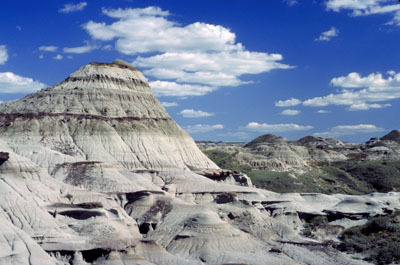 Encompassing badlands and prairie Dinosaur Provincial Park (established 1955, 70 km2) lies along the Red Deer River in southeastern Alberta. Natural History The mountains, which dominate the park and rise to 2678 m at Mount Garibaldi, are of recent volcanic origin. Lava from Price Mountain created a dam allowing 300 m deep Lake Garibaldi to form. Located some 45 km east of Flin Flon, Grass River Provincial Park (established 1963, 2289.63 km2) straddles 2 of Manitoba's natural regions (Boreal Plains and Boreal Shield). Near the south end of Lake WINNIPEG some 160 km north of Winnipeg is Hecla Provincial Park (established 1969, 865.4 km2). Nestled among the West Isles in the Bay of Fundy is New Brunswick's Campobello Island, the home of Herring Cove Provincial Park (established 1959, 424 ha). Natural History The park's most striking feature is a series of rock ridges consisting mostly of white quartzite. These large, rounded hills are the remains of the La Cloche range, a ring of Precambrian mountains that once towered higher than the present-day Rockies. Natural History Pink granitic hills and boulders dominate the landscape but lavas are found near Cape Gargantua and sandstones on the offshore islands. The mixed forest of maple, birch, poplar and spruce produces a magnificent display of colour in autumn. 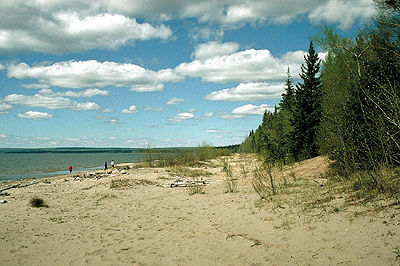 A landscape of forests and lakes, Lakeland Provincial Park (established 1992, 147 km2) is located east of LAC LA BICHE about 250 km northeast of Edmonton. Natural History Prevailing winds aided by major storms have produced some of the finest beaches in the province. Named after the Duke of DEVONSHIRE, who visited the area in 1920, Devonshire beach is popular for swimming, wind surfing and sand castle competitions. 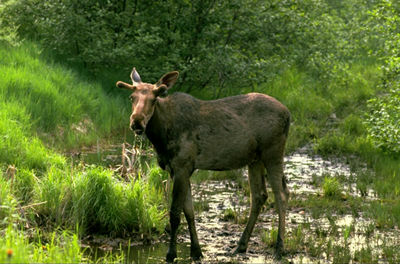 New Brunswick's largest PROVINCIAL PARK, Mount Carleton Provincial Park (established 1970, 174.27 km2), features forests and abundant wildlife. Mount Edziza Provincial Park (est 1972, 2300 km 2 ha) comprises part of the Tahltan Highlands, between the Stikine and Iskut rivers in BC. The nearest community is Telegraph Creek, 20 km northwest of the park. 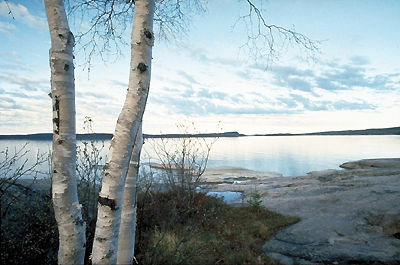 Interest from local residents led to the establishment of Notikewin Provincial Park (established 1979, 97 km2). Here is preserved a small piece of the quintessential natural landscape of northern Alberta, the once endless poplar and spruce forests deeply dissected by moody rivers. Nestled in the lush forests of central Newfoundland, Notre Dame Provincial Park (established 1959, 113 ha) borders on the serene waters of Junction Pond. 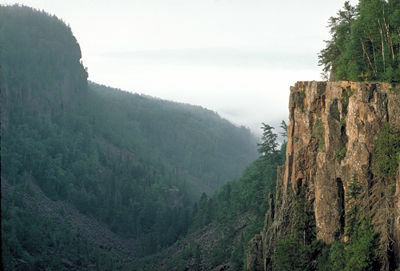 A spectacular, steep-sided gorge cut into volcanic rock of Lake Superior's northern shore is protected in Ouimet Canyon Provincial Park (established 1972, 777 ha), 65 km northeast of Thunder Bay, Ontario.